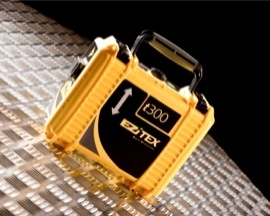 The NEW EZiTEX t300 delivers significantly higher power output than previous transmitters on the market. EZiTEX Signal Transmitters Deliver significantly higher power than previous model transmitters. Trace services over a greater distance. Improve service detection in areas of high signal interference. Improve depth estimation when using a depth locator. Four adjustable output levels, delivering a maximum output level of up to 3 watts (EZiTEX t300). Environmental protection rating of IP65. 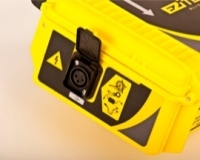 Robust, compact and lightweight design engineered for tough site conditions. Choice of 3 tracing signals. 33K everyday site use, generally accepted as an industry standard. 8K long tracing and reduced cross coupling. 8 and 33K (connection mode). Ease of use – default output frequency of 33K. Externally located clear, audio visual controls. This ensures a robust waterproof design. In-built test function – allowing operators to test the hardware and software functionality of the EZiTEX before use. Producing up to 3 watts of power through 8 kHz or 33 kHz dual frequency modes and boasting an IP65 rating, the transmitter is fully protected even in the harshest of conditions. Four adjustable output levels, delivering a maximum output level of 1 watt. Durable waterproof design – environmental protection rating of IP65. Robust, compact and lightweight design engineered for tough site conditions. In built test function – allowing operatorsto test the hardware and software functionality of the EZiTEX before use. 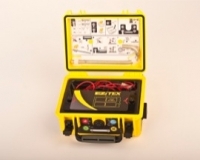 Connect the EZiTEX to a conductive service such as a valve, junction box or other access point. A Signal Clamp is used to apply the EZiTEX signal to an insulated electricity cable. Supply is not interrupted by the signal and the operator is not exposed to any live services, such as a valve, junction box or other access point. Click here for information on the Signal Clamp. The EZiTEX induces a tracing signal into the buried service. This is a quick and convenient method when direct connection or signal clamping is not possible. Four adjustable output evels, delivering a maximum output level of 1 watt.